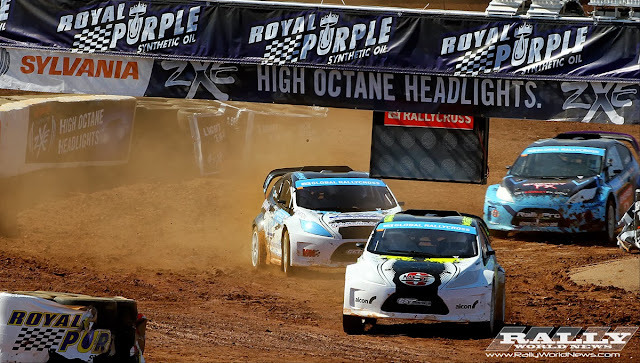 Toomas "Topi" Heikkinen clinched the 2013 Global Rallycross Championship at The Dirt Track, at Charlotte Motor Speedway, along with a cool twenty thousand dollars for also winning the Sylvania SilverStar zXe Cup. Another 1-2-3 for Ford. Heikkinen may have won the war, but third overall was the best he could manage in a tough final battle. 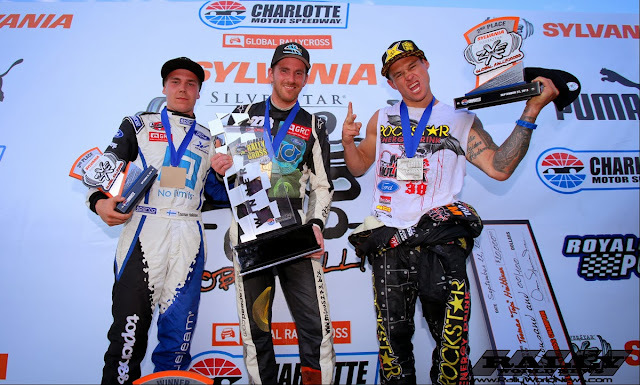 Scott Speed (center) took the overall victory at Charlotte, with Brian Deegan rounding out the podium. Yet another classic first turn pile up in the GRC final at Charlotte. We find it hard to understand, other than it makes for an exciting TV show for the fans, how the manufactures can continue to let destruction and hard hitting continue. Scott Speed got the hole shot on the restart and basically cruised to victory, while others continued to battle it out behind. Subaru continues to make great improvements in power and reliability in their Rallycross program, but getting a clean run in the final is still a massive challenge for all involved. GRC seems to loose the black flag when the TV schedule tightens up. Despite a lot of rough driving in the final only one black flag was displayed. If all GRC finals were like this!! Far and away the best battle of the day was between Brian Deegan in the Rockstar Ford Fiesta and Sverre Isachsen in the Puma Subaru. Deegan and Isachsen went door to door throughout their heat, with Sverre nipping Deegan on the line for the victory for Subaru. Brian Deegan scored a fine second place in the final but it could have been an overall victory had he not been barged from behind and turned around by Scott Speed in the first try at the final. One of the top privateers to compete in the Global Rallycross since it inception, Stephan Verdier made a return to the action in Charlotte behind the wheel if a Rhys Millen Racing prepared Hyundai. Stephan was quick through the heats, and despite a little tangle with Ken Block in the final he still managed a top five finish. Stephan is one of those quick privateer drivers that we truly hope can get a chance to prove his worth in a factory backed car for 2014. 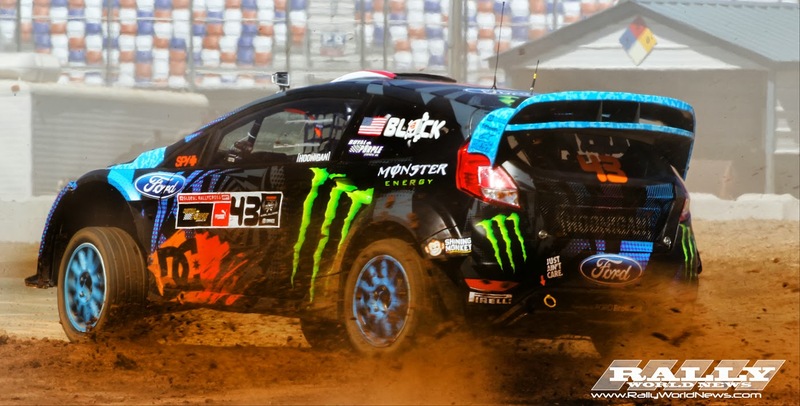 Ken Block would again dominate in the heats posting fastest times in both of his heats. Ken continues to struggle with his reaction time off the line in the final. Hoonigan Racing's Ken Block would have pole position for the final, but he would be lose his advantage off the line by the F1 reaction speed of Scott Speed, which left Block getting caught up in the first turn carnage. Despite a front tire puncture in the opening laps Block would charge on and eventually finish 7th overall. 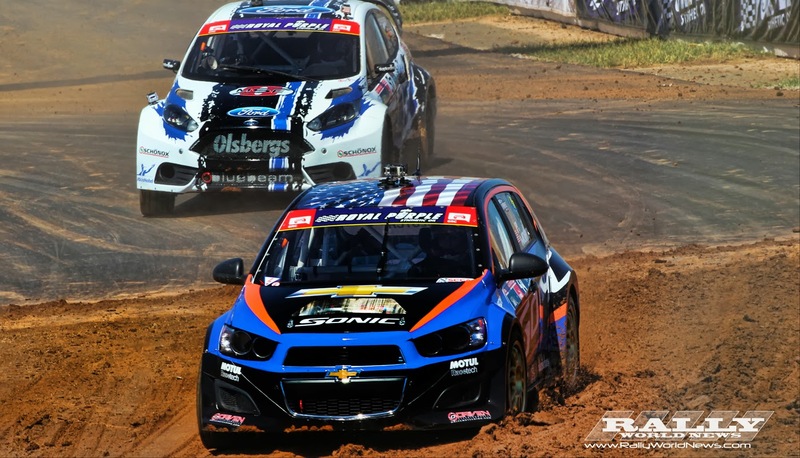 Travis Pastrana's Red Bull / Discount Tire sponsored Dodge team are suffering a very similar fate as Subaru had earlier in the year. Despite some good speed from Travis in the heats, the Dodge was crippled in the final by what seemed like minimal contact. The cars need some more development to make them a little more durable for the tight, tough racing in the GRC. After a long development phase, Pat Morro final took the wraps of his new Chevrolet Sonic. As with any new car, Pat and his team would work on bugs throughout the weekend. Although Morro does not have the full backing from Chevrolet on the project, this first outing shows that the Sonic has potential. Morro is also in development of a second Sonic for 2014. 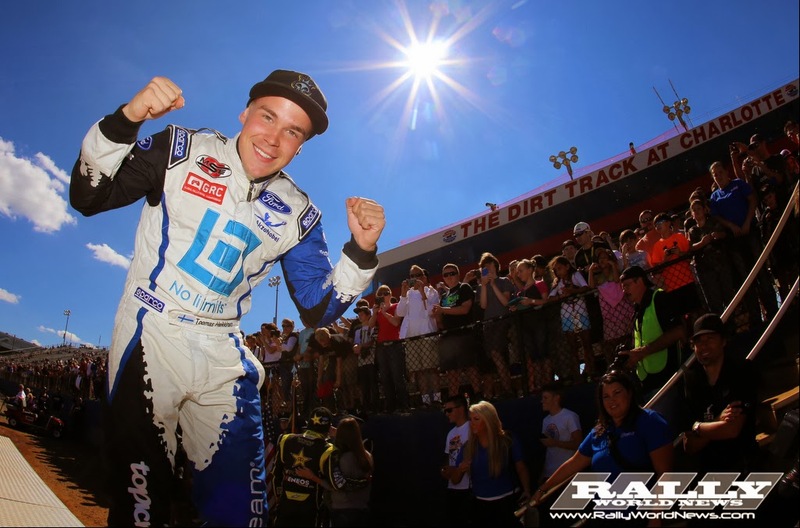 Pat will be back in action in Las Vegas in the final round of the 2014 Global Rallycross Championship. The mostly asphalt course in Vegas will be better suited to the Sonic which lacked suspension travel for The Dirt Track. Dave Mirra started his Rally career in 2008 with Subaru. He has competed in both the Rally America Championship and battling in the Global Rallycross Championship since it inception. Despite some challenging moments along the way Dave has got on the podium in both series on more than one occasion. In the weeks leading up to the penultimate round of the GRC in Charlotte an announcement hit the newswire that Mirra and Subaru were parting ways, thus leaving Dave without a drive for the final GRC rounds. 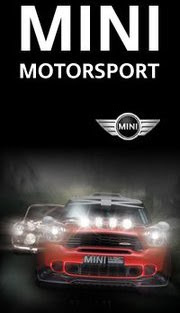 With the support of PUMA, Dave would work out a deal with Liam Doran to drive his Prodrive prepared Mini in Charlotte. Dave's transition to the Mini was seamless. A quick change of livery and Mirra was throwing down some impressive lap times in practice. Onto the heats, Dave would get a controversial black flag for what seemed to the officials as a jump start. Despite a stop and go penalty Mirra was able to battle back to within striking distance of Pastrana who was leading the heat. Unfortunately, Mirra would tag a barrier while on Pastrana's rear bumper which resulted in a spin..
Mirra would not make it to the final after he was barged off the track by Tanner Foust who struggled with a jammed throttle. Despite not getting a chance to battle for the victory in the final, Mirra showed some great potential in the Mini. We have some unconfirmed reports that Mirra could be in a second Mini in Las Vegas. We hope to see Mirra back in a permanent ride for 2014. 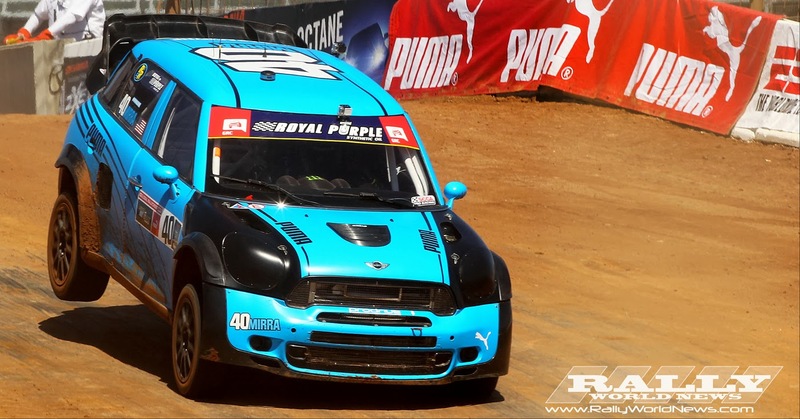 Tanner Foust was not on his game in Charlotte. He got caught up in a first corner wreck in the heats which would result in the first red flag of the day. Fans and fellow competitors were concerned as Foust did not emerge from the car until it was turned upright. We would find out later that Tanner was pleading with the safety crew to roll the car onto his wheels so he could take the restart. Despite the fact that Foust was un injured in the soft roll, the rules state that he needed to go to the medical center after an accident. Foust would return for the LCQ, but mechanical issues would ground him for the final. 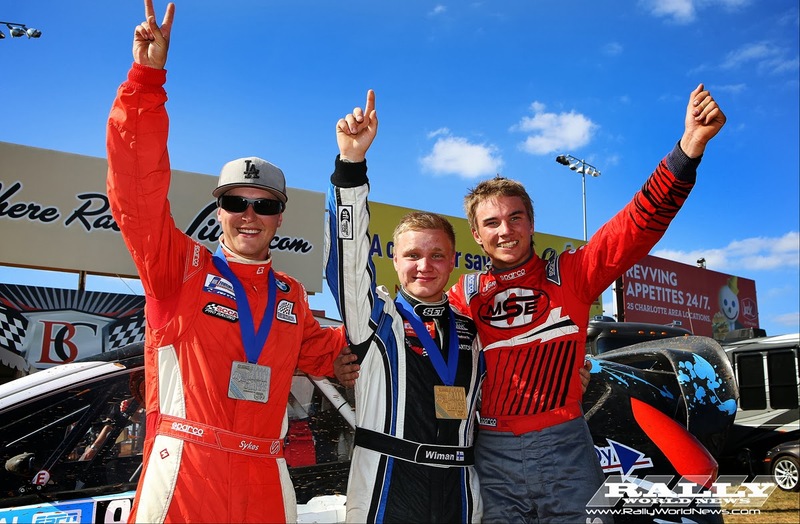 Joni Wiman [center] remains perfect in GRC Lites competition, winning his fifth consecutive race at The Dirt Track on Charlotte. This victory, over Geoff Sykes [left] and Sebastian Eriksson, extended Wiman’s points lead to 29—clinching him the inaugural series title. Although the GRC Lites are a far cry from an affordable entry point in the Global Rallycross Championship, they definitely are an exciting addition to the series. It will be interesting to see how the GRC Lite will roll out in 2014 and who will be driving. For the second race in a row, Wiman failed to secure the hole shot in the final, this time falling behind Kevin Eriksson as a rough start dropped deJong through the field. But Eriksson’s good luck faded fairly quickly, as a cut right rear tire dropped him through the field like a stone until he eventually ended up seventh. Geoff Sykes managed to avoid trouble at the start to coast to an easy second place, while jostling between the rest of the field allowed Sebastian Eriksson, who had missed his second heat race, to climb from ninth to fourth in the first lap. He battled with deJong once again, reminiscent of their duel in Atlanta, but held third place.